Gajraj is thought to have been taken from the forest as a 12-year-old in 1965. He was then forced to make the 800-kilometre journey from Ujjain, Madhya Pradesh, to Satara, Maharashtra, which reportedly took a month and a half. His transfer was illegal. The rescue wasn’t easy: hundreds of misguided local villagers protested, and his mahout and some protesters even threatened mass suicide. But he is now on his way now to the Elephant Conservation and Care Centre (ECCC) in Mathurato to receive vital veterinary treatment and begin his integration into the company of fellow elephants after all these years alone. 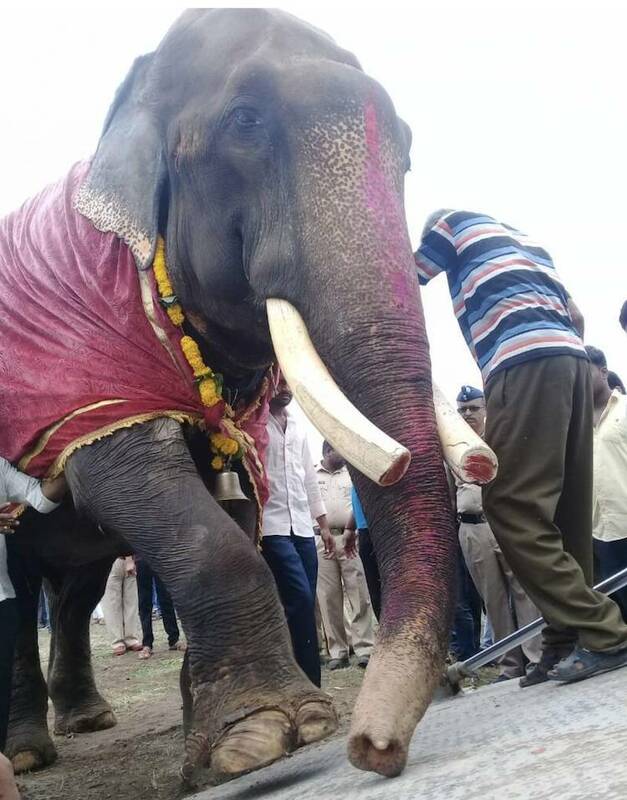 After more than 50 long years chained near the popular tourist spots Shri Bhavani Museum and Yamai Devi temple in Aundh, Satara, Gajraj has finally been rescued from his chains. This old elephant, whose appalling treatment sparked a global #FreeGajraj campaign led by PETA India and its international affiliates, is on his way now to the Elephant Conservation and Care Centre (ECCC) in Mathura – a collaborative project of PETA India, Wildlife SOS, and the Uttar Pradesh Forest and Wildlife Department – to receive vital veterinary treatment and begin his integration into the company of fellow elephants after all these years alone. He was rescued by the Maharashtra Forest Department and is being accompanied to the ECCC by an expert veterinary team. PETA arranged for the Wildlife SOS elephant-care centre to take him in, a collaboration, and PETA has paid for his new home and other costs. The Maharashtra Forest Department’s much-commended decision to rescue ailing Gajraj comes after more than 200,000 supporters of PETA India and its affiliates advocated for his release. But the rescue wasn’t easy: hundreds of misguided local villagers protested, and his mahout and some protesters even threatened mass suicide. In April, Maharashtra government–appointed veterinarians confirmed PETA India veterinarians’ earlier findings that this elderly elephant is suffering from weakness and untreated prolonged abscesses on his hindquarters and elbows as well as painful foot conditions and that his custodian and mahout have failed to maintain even basic health-care records, such as treatment, deworming, and vaccination registers, adding to suspicions that no such care has been given in years. Videos from a recent PETA India eyewitness investigation show Gajraj swaying back and forth and bobbing his head – behaviour indicating severe stress. Elephants in the wild live in matriarchal herds and are active for 18 hours a day, foraging for fresh vegetation, playing, bathing in rivers, and travelling as far as 50 kilometres. Elephants in captivity are denied the opportunity to roam vast distances and often suffer from foot problems and arthritis because of long periods spent standing on hard surfaces. They can develop neurotic and self-harming behaviour, and many die prematurely. The #FreeGajraj campaign was also supported by numerous kind celebrities – including Jacqueline Fernandez, Athiya Shetty, Suniel Shetty, Sunny Leone, Sidharth Malhotra, and Sonakshi Sinha – who all shared information about his plight on social media.